The Best Typing Games For Kids: Who Says Learning Can't Be Fun? The Best Typing Games For Kids: Who Says Learning Can’t Be Fun? As we move into the digital age, knowing how to type is more important than ever. Luckily for us, typing games for kids are making the learning process a lot more fun than it was back in the day. Getting your child fluent with computers and an on the keyboard will give them a huge advantage at school and beyond. Teaching your child the ABC of typing can be hard, but we are here to help you make the best choice. Typing games are interactive applications which users can either open in their browser or download on their computers. Using these kid-friendly applications, parents can teach their children the ABC of typing and use a computer keyboard. The games usually start with the basics: explaining how a keyboard works, showing your kid where and how to find all the keys and, most importantly, how to position their hands on top of the keyboard. Typing games are good educational assets and can help your kid improve his spelling skills. Moreover, many of the games presented below will have various difficulty levels, starting with simple tasks, like identifying the “Tab” key all the way up to writing full paragraphs. Naturally, it’s up to you to decide which games are suited for your kid’s language level, but we’ll make it easier for you. 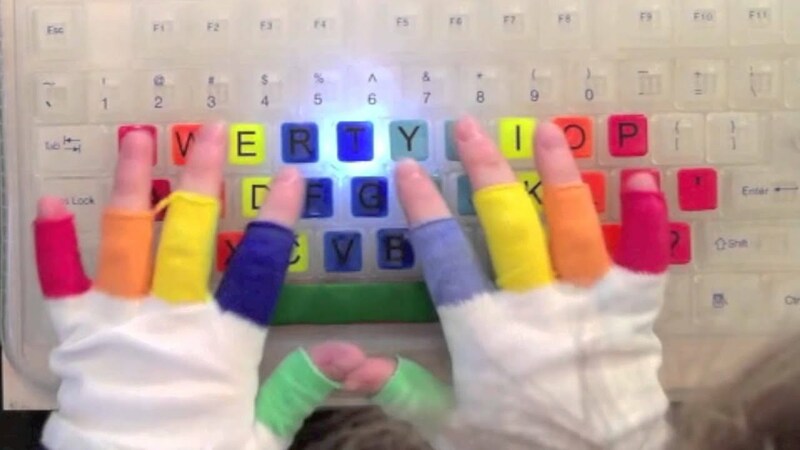 Without further ado, here’s a list of typing games for kids and parents alike. Note that the games are not only fun, but they’re educative as well. It’s a spookily fun typing game, which turns your kid into an actual ghost hunter. The goal of the game is to make the spirits go away by typing each word. But remember: you have to enter the word before the ghost gets too close to you. Typing of the Ghosts is a great start for children learning to read and to write and can be an excellent auxiliary material. Just remember to install the latest version of Flash player before starting this fun and interactive spelling lesson. Prove that you are the ultimate typing warrior by vanquishing the enemy army. Boys will be boys when it comes to playing computer games. Every once in a while, every child dreams of being in the military and fighting epic battles. This game is perfect for kids who like army-related stuff, and it’s an excellent kick-off to their typing and spelling skills. The goal of the game is simple: you are a lone soldier who must defend against hordes of merciless enemies. QWERTY Warriors can help your child master two aspects of learning a keyboard: how to position his hands and how to quickly identify the letters. Keep in mind that the game can sometimes be pretty graphic, so it will be a good idea to supervise your child while playing the game. You can also turn off any undesirable feature by navigating to the game’s options section. Big Brown Bear can teach your kids how to rest their hands over the keyboard to type faster. The Big Brown Bear is mostly suited for kindergartners and first-grade students. Teaching your kid how to use a keyboard can sometimes be a hard thing for parents, but this application makes your job a whole lot easier. The application starts simply: the first levels are designed to familiarize your kid with the letters on the keyboard and how to find them. Based on his level of experience, the game features several difficulty levels. In the first levels, the kids will have to identify individual letters and use the correct finger to press them. As they progress, the game will introduce more letters and, eventually symbols. The game might not be as graphically appealing as QWERTY Warriors or Typing of the Ghosts, but it’s a great start towards becoming a keyboard wizard. Help the monkey reach the bananas by typing in the correct letters. Help the monkey climb the tree by typing in the letters and words as fast as possible. The game is excellent, especially for 6th graders who wish to learn new words and ways to type them more quickly using a computer keyboard. Hand positioning is a very important lesson when it comes to typing. Help your kid become the ultimate keyboard master with the Typing Practice Saga, which includes categories like Sports, Animals, and States. As far as kids typing games go, this is probably the best mixture of keyboard proficiency and improving vocabulary skills. Remove and restack the cups using your keyboard. The goal of the game is straightforward and fun: remove or stack the cups up by typing in the letters printed on them. The whole trick of the game is to know the position of your fingers on the keyboard to speed up the process. Improve your keyboard typing with Keybr. Keybr might not be as good looking as Keyboard climbing or other games, but it’s an excellent way to improve your child’s typing skills. The goal of the game is to type the letters shown on the screen without looking at the keyboard. Familiarized your child with the inner workings of the internet can be a great thing, but it’s still unwise to let your child access Internet content without strict supervision. For those who want to limit the child’s access to the Internet, there are a couple of offline typing application which you can download. Note that some of them are free of charges, while others charge. Determine Tux, the penguin, to go on a diet. Penguins are cute animals. Think about the “Dancing Feet” movie. Children often love penguins for their silly walk. The Tux Typing game is a great started when it comes to typing skills. The whole purpose of the game is to prevent Tux, the forever hungry penguin, from eating too many fish. Fish will fall from the sky, each of them having a particular letter or word prevent them. Players will have to type in the words before the fish falls on the ground, ending up in Tux’s belly. Experience your very own underwater adventure with Spongebob Squarepants. Spongebob, the friendly sea sponge, is the children’s favorite. With his goofy looks and clumsiness, Spongebob can put on a smile on everyone’s face. There are quite a lot of Spongebob-related games out there, but most of them are far from the educative side. However, there is one called Spongebob Squarepants Typing, which teaches your kids what they need to know about writing on a keyboard. The game has all kinds of fun activities, like making Spongebob’s car drive faster by typing the words which appear on the dashboard. The game has progress tracked to show how your child has improved since the beginning of the game. Unlike the Tux Typing games, Spongebob Squarepants is not free for download. However, if you wish to see whether your kid likes the game, you can download a free trial of the game, then buy the game. Bring down the enemy’s air armada with your keyboard. The game is actually an intelligent blend of dogfighting and vocabulary skills. Finish off the enemy squadron by typing the words displayed on the planes. Of course, the game has many difficulty levels, from simple letters to complicated words. Pay attention to those mean bosses, because they can throw at you some pretty nasty words. As far as kids typing games go, these are by far the most fun and challenging. Learning how to type and read can be, by far, the most valuable lesson which a child must learn. But, remember: everything in moderation, so don’t let your child spend too much time in front of the computer.